(a) Perform a pull-in test. 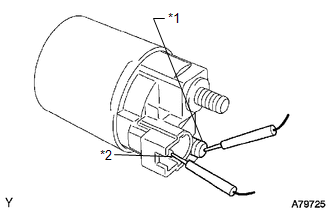 (1) Remove the nut and disconnect the lead wire from terminal C.
(2) Connect the battery to the magnetic switch as shown in the illustration. Check that the clutch pinion gear extends. 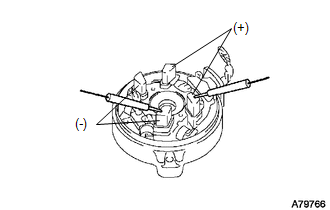 If the clutch pinion gear does not move, replace the magnetic switch assembly. (b) Perform a hold-in test. (1) While maintaining the battery connections of the pull-in test above, disconnect the negative (-) lead from terminal C. Check that the pinion gear remains extended. If the clutch pinion gear returns inward, replace the magnetic switch assembly. (c) Perform a clutch pinion gear return test. 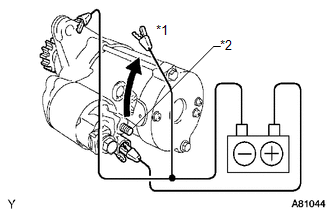 (1) Disconnect the negative (-) lead from the starter body. Check that the clutch pinion gear returns. 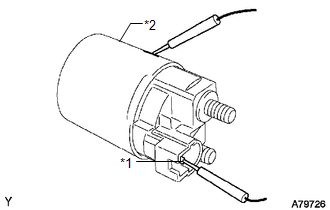 If the clutch pinion gear does not return, replace the magnetic switch assembly. (d) Perform a no-load performance test. (1) Connect the lead wire to terminal C with the nut. Make sure that the lead is not grounded. (2) Clamp the starter in a vise. 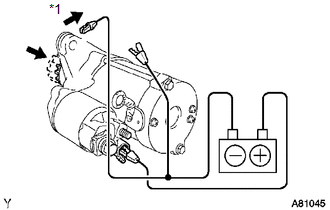 (3) Connect the battery and an ammeter to the starter as shown in the illustration. 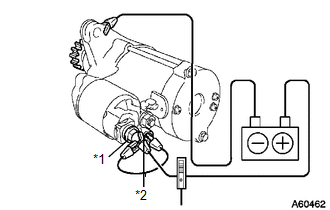 (4) Check that the starter rotates smoothly and steadily while the pinion gear is moving out. Then measure the current. 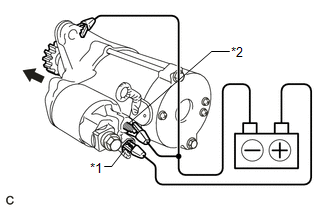 If the result is not as specified, repair or replace the starter assembly. 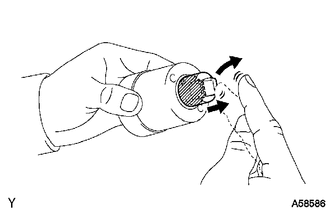 (1) Push in the plunger and check that it returns quickly to its original position. (1) Measure the resistance between terminals 50 and C.
(1) Measure the resistance between terminal 50 and the switch body. If these is no continuity between any segments, replace the starter armature assembly. 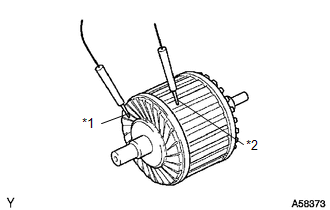 (1) Measure the resistance between the segments of the commutator. 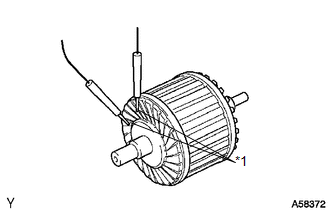 (1) Measure the resistance between the commutator and armature coil core. 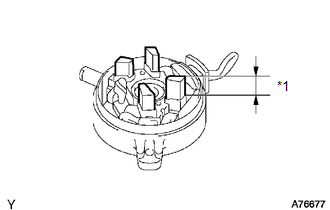 (d) Using a vernier caliper, measure the commutator length. 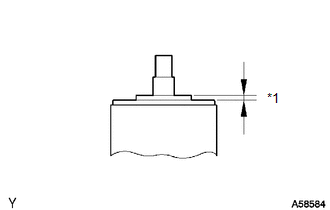 (1) Measure the resistance between the positive (+) and negative (-) brushes. If the result is not as specified, replace the end frame assembly. 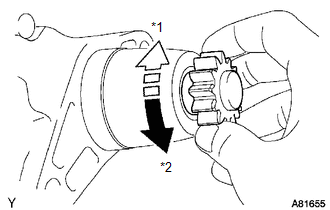 (a) Rotate the clutch pinion gear counterclockwise and check that it turns freely. Try to rotate the clutch pinion gear clockwise and check that it locks.